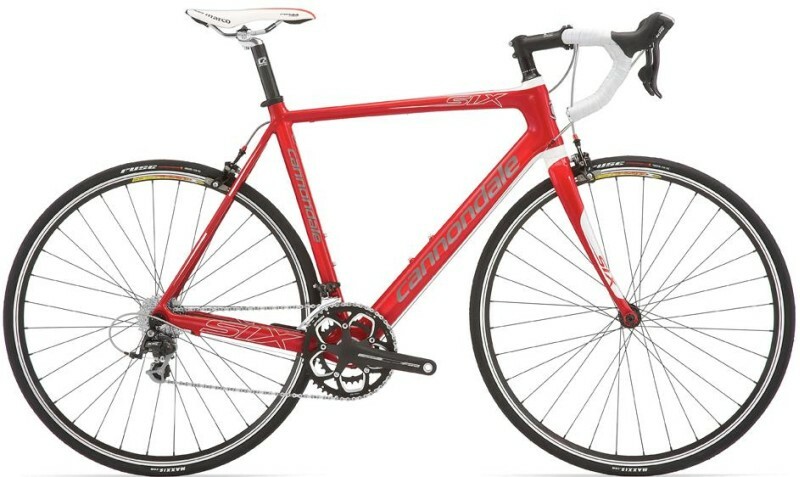 The U.S. Consumer Product Safety Commission announced a voluntary recall of about 1,300 Cannondale 2009 Six 5, Six 6, Six Carbon 5 and Six Carbon 6 Bicycles. No incidents or injuries have been reported so far. 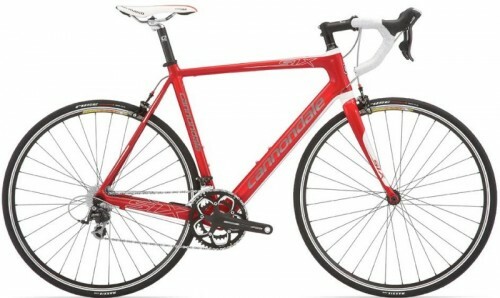 The bikes were sold by authorized Cannondale dealers from October 2008 through February 2009 for between $1,500 and $2,100. Consumers should stop using the recalled bicycles immediately and contact any authorized Cannondale dealer for a free repair. I just checked my bike farm. My Surly Long Haul Trucker and my wife’s Trek Navigator 300 have pr0tectors. My Trek 1220 doesn’t (I think it DID have one, but it disappeared after a trip to an LBS), nor does an ancient three-speed. Must not be one of those things I spend a lot of time thinking about. I would have said the same thing about the PITA “lawyer lips” (** see below) that are designed to hold your front wheel on until I read a comment on EcoVelo this morning where a guy noticed a strange noise coming from the front of his bike and found that they were the only thing holding the wheel on. My guess is that the folks who are buying carbon bikes are the same folks who would take the spoke protectors off to save a couple of grams. This has been done by encumbering fork ends with extra hardware, ridges or lumps that keep the wheel sort-of attached even if it has been installed by someone who doesn’t know what he or she is doing. Unfortunately, this means that the quick-release mechanism must be re-adjusted each time it is used, seriously slowing down the operation. Neither my American-made Trek 7300 nor my fancy Italian Bianchi have spoke protectors. Sarah’s Trek, also a 7300, does have spoke protectors. I had the Trek’s rear wheel rebuilt at some point and I imagine it wasn’t put back on the bike. This seems like a non-issue. My aging Trek “multi track” DOES have the spoke protectors. Looks like two layers of them, one a smaller diameter than the other. But it also has the quick-release front wheels. I agree with Matt. Of all the ways it’s possible to get hurt on a bike, these seem like pretty rare/odd ones. My Trek Madone 5.5 does not have it, it may have had it, but I could have discarded it when I DID throw away the bike valve stem covers and the goofy ring that also goes around the stem (grams are grams and it ALL adds up when the humidity level here is 99%, the temps are hot enough to roast a chicken and the hill I’m looking up at seems to be growing in elevation like the stalk in Jack in the bean stalk) and I don’t feel bad about any of the missing hardware. 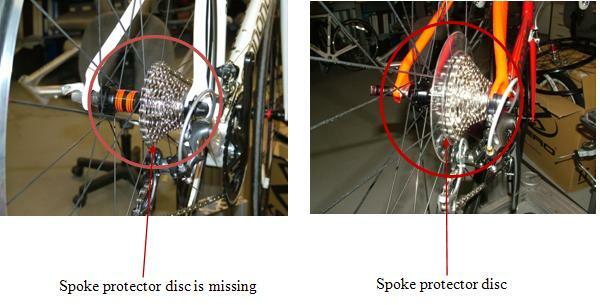 Ah, when was the last time you had a spoke break and jam up your wheel? Or when was the last time you had a chain break and jam up your wheel? I thought so. I suspect more people with clip-in shoes forget to unclip at the last moment and kiss the pavement than there are spoke or chain issues. Who wants to bet a lawyer was out riding his bike and a freak accident that involving his spoke/chain sent his tan chin to the pavement and THAT is why this is now an issue? Let the brave ride bikes and let the meek walk on the sidewalks. But maybe I’m just bitter. Have you considered pulling out your electric drill and adding a bunch of holes to your frame and handlebars to reduce the weight more? And, I bet you really only need about half the screws that hold it together. Bar tape, that’s another thing you could get rid of. Real men can hold onto the handlebars. And the seat. What a waste of grams. Adopt a standing pedaling style and you can get rid of the seat AND the seat post. In fact, if I got rid of the seat, I’d be darned SURE I got rid of the seat post. You know I have done just about everything I can to get rid of all excess weight. Bought the plastic bike, got smaller water bottles, eliminated all unnecessary ornaments (couldn’t get the logos off, they are baked into the plastic frame) and even offered YOU my extra kidney to lighten my load. The next logical step would be to get a unicycle but that is going to have to wait until I get the vertigo under control. Learn to set your high stop. I personally wouldn’t want to be riding next to or behind Steinie when he does have a spoke/chain flyover. The weight of the bike crashing on anything living nearby is going to amount to a hospital trip if there’s still a pulse. You two brothers are so diametrically opposed, Marky. What I can’t figure out for the life of me is how, after pushing that full honking rig, that Steinie South has even one ounce of excess body weight. I continue to be amazed how much he can attach to that thing without resorting to training wheels for stabilization, or else a BOB. Or an overhead bin. The “haul” in the bike name wasn’t meant to be taken so literally, methinks. PS: “More lighter” hurts my ears. Jan, you don’t lose weight just by owning a heavy bike… you actually have to ride it, too. That is where the disconnect comes. I have bikes with and without. I just make a habit of tucking the lace on my right hand shoe down under. I have another pair of shoes with a lace catcher in the middle. Don’t know how to describe it better, folks. You just tuck the extra shoe lace into it and it is in the middle. Since I don’t know what bike I’ll be riding when I put on my shoes, I find my habit works. Probably something that should be stated in the bicycle manuals – but nobody reads them except me. Matt: He’s too busy blogging — so be thankful for that.